Villennes sur Seine is a small town in the west of Paris on the river Seine. 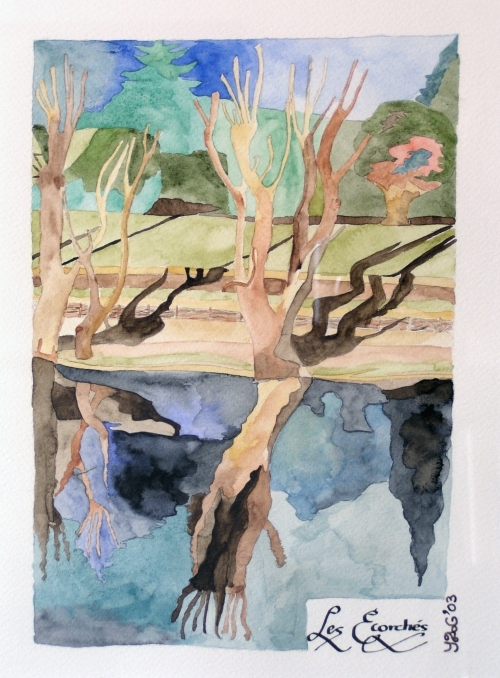 I painted that watercolour after a stroll by the river. It strikes me that trees are usually pollarded (that is to say “cut to trunk in order to a tree cut back to the trunk to promote the growth of a dense head of foliage” – Webster dictionary). The best example of pollarded trees in the UK is to be found in the amazing and beautiful ancient forest of Burnham Beeches in the west of London, near Uxbridge (Middx.) I shall make a reconstructed painting of Burnham beeches one day.